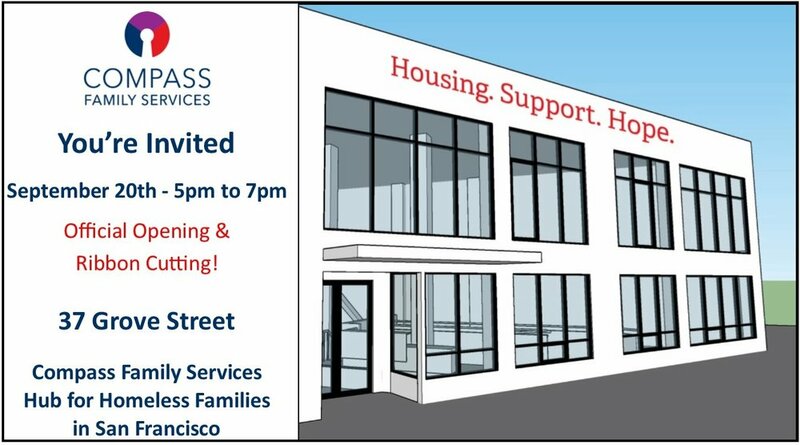 Over the past month we moved three of our direct service programs, Compass Connecting Point, Compass SF HOME and Compass Clinical Services, as well as our administrative offices, to our new home at 37 Grove Street, creating a permanent service hub for homeless and at-risk families in San Francisco. For the past few years, skyrocketing commercial rents have been driving nonprofits that provide key services to the residents of San Francisco out of the City. This wasn’t an option for Compass Family Services, given our mission to serve San Francisco families, and that's why we took a huge leap in purchasing a building in the heart of the City, saying to families in need, we see you, we are not going anywhere, and we are investing in your future. Located steps away from City Hall, the building has more than 18,000 square feet of usable space and will serve over 1,300 households each year with a staff of 55 housing counselors, case managers and mental health clinicians, as well as the administrative services and support needed to make their work happen. All program sites combined, Compass provides services to more than 5,000 parents and children, or just more than 1,700 families, each year. The new Compass Family Services hub provides a welcoming and healing environment where vulnerable families who are experiencing the trauma of homelessness can access a myriad of interrelated and complementary housing and support services all under one roof, in a setting designed to provide hope for each family’s future, as well as for our community. Compass worked with Equity Community Builders to secure New Markets Tax Credit financing (NMTC). Opportunity Fund provided $14.2 million in NMTC allocations, Chase provided the NMTC equity investment, and the Low Income Investment Fund loaned Compass $8.2 million for the deal. Additionally, a $1 million grant was awarded to Compass Family Services from the Northern California Community Loan Fund through the Nonprofit Space Investment Fund, which is funded by the Office of Economic and Workforce Development. A ribbon cutting and open house will take place on Thursday, September 20th from 5 to 7 pm at 37 Grove Street in San Francisco. Mayor London Breed is set to speak. The public is welcome to attend. RSVP to kotridge@compass-sf.org. Learn more about Compass Family Services by visiting: www.compass-sf.org. Watch a short video featuring children currently living at Compass Clara House.